Oron Stenesh brings his unique brand of cabaret to the Twin Cities direct from New York City where he spent 8 years as a music theatre actor and cabaret performer. Oron sings, dances, spits spoken word on the mic, gets political, and generally enjoys himself and encourages you to do the same at his "O" shows. Most recently, he played Bryant Lake Bowl in "HerniO: Stories of Strains." His Minneapolis debut was, naturally, "Minne-O-polis." In New York, Oron received a MAC Award Nomination (2011) for "The Big 3-0" and also performed "Olection" and "The O Train" at the Duplex. He toured "Olection" to Chicago’s Davenport’s Piano Bar. Selected theatre credits include an International Tour of Fame (as Schlomo), Babes in Toyland (Lincoln Center), Far Away (New York Theatre Workshop), A Stoop on Orchard Street (Off Broadway/Mazer), A Christmas Carol (McCarter), and Mike Mulligan and His Steam Shovel (Theatreworks/USA). He has also appeared on "One Life to Live" as Walt, an orderly that escorted a crazy person to a psych ward before being unceremoniously jettisoned from the ambulance when it ran off the road! 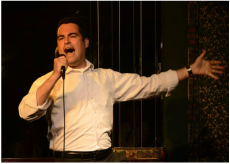 ​Oron is a graduate of Northwestern University’s Theatre and Musical Theatre programs, attendee at the 2007 Cabaret Conference at Yale University, and proud member of MAC, AEA, and AFTRA.